This week's post will look a little different. Each month, I write a letter about using clarity and consistency to create content, a business, and a life with meaning. And I only send it to my newsletter subscribers. This week's letter will be a continuation of this post on finding your core message. In the email, I'll be talking about how you can share that message consistently—without feeling like you're a broken record. It will go out tomorrow, so if you want in, scroll down to the bottom of this post and sign up! But I don't want to leave this blog sad and lonely this week, so I'll be sharing a little roundup of where you can see me elsewhere and some things I've been loving lately. You can dive into both of those below, and I hope I'll see you in your inbox tomorrow! 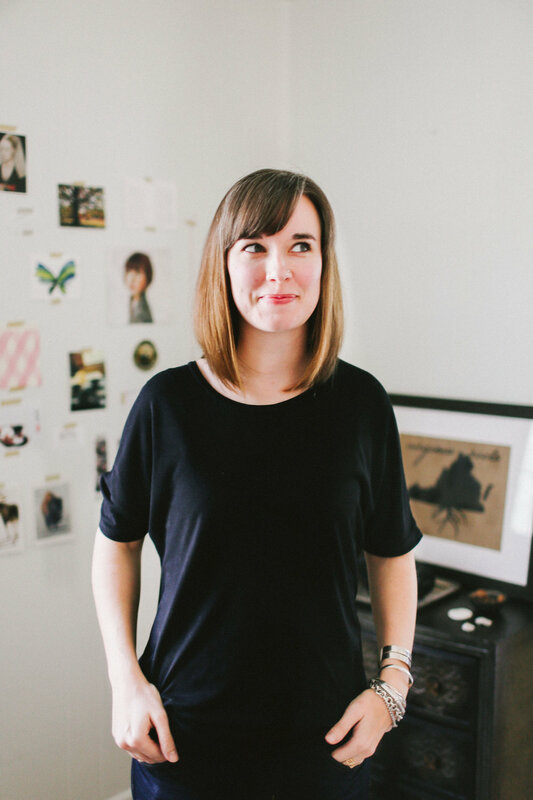 The wonderful Erin Haslag of Coin Design Studio featured me on her blog, Coined Life. She asked some great questions, and if you've been wondering about how I got to where I am today and how I spend my days, this one is for you! Today wraps up a three-part series on using clarity and consistency to organize almost everything in your life. My friends over at Pure Green magazine (do you read it? It's a really good magazine that takes a non-judgmental, beauty-centric approach to green and conscious living) were kind enough to share my thoughts on their site. *Note: To read these, you'll need to sign up for the Pure Green community, but it's totally free and the content their team puts out is well worth giving them your email address! Tara will also be mentioned in tomorrow's email (teaser! ), and this won't be the last you'll hear from me about her. She's a fantastic teacher and is thinking about business in ways that I don't see anywhere else. She's running a twenty-five-lesson series on CreativeLive (each lesson is about an hour long) about how to build a business that stands out. She has already started, but you can jump in and see if you like her style, and then buy the entire course to catch up (the price is discounted until the live class ends!). I can't remember how I ran across Julie's site, but I'm SO glad I did. She says, "I see a world where women develop the creative habits and wellbeing to see projects through," and she shares beautiful essays that help create that world. Each week, she also rounds up some must-read articles from across the web, and I look forward to them every single week. I'm guessing you've heard of this one, but if you haven't, you're in for a treat! Kathleen of Braid Creative and Emily of Indie Shopography (both friends and women I've worked with and highly respect and admire) have created a super-fun, honest, kick-in-the-pants podcast about all things business. I've loved every episode and I'm pretty sure you will as well! I'm somehow new to this gem of a podcast, but it hasn't taken me long to catch up. I love how Paul and Jason are totally open about whatever topic they discuss, and the dynamic between them is great. They're both funny in totally different ways, and I love listening to anything they have to say. Note: None of these are affiliate links, and no one asked me to share. These are all just things that have been making a difference in my life lately! Thanks for inviting me into your inbox! Check your email; you'll need to confirm that you'd like to receive letters from me. See you there! Just about a month ago, I announced I would be taking a bit of a break from posting in this space. I didn’t take a break from working or writing behind the scenes, though, and I’m super excited to announce that I’ll be launching my new website and new business direction early next week! Recently, I hired Braid Creative to help me explain what I do with both words and visuals, and oh man, they knocked it out of the park. I’ll be sharing a sneak peek for my newsletter subscribers tomorrow (you can sign up in the sidebar on the blog, so hop on over if you want to be in the know!). I can’t wait to share my new site with you, and to keep connecting with you in this space in an even more intentional way. Have a beautiful week! Recently, I was confronted with my past. And I survived unscathed! A couple of years ago, the wonderful Rena Tom (if you don’t know who she is and you’re not following her everywhere she can be followed, I’m sorry to say you’re missing out) asked me to write some notes for product-based businesses on finding your voice. Of course, I said yes! (When Rena asks, you agree. Period.) At the time, she used what I sent her in a series of workshops she was putting on called Retail Readiness. And a bit later, she started working on a book by the same name, and of course, I agreed to have my piece included there as well. But things got a bit busy for Rena (a little thing called Makeshift Society happened—maybe you’ve heard of it?) and the book got stalled for a while. Just recently, though, she brought the project back to life, and asked me to review my part to make sure it was still relevant. You know that feeling you get when you have to review older work? That panic that everything you’ve ever written is total crap and you’re going to be so embarrassed to even look at it? Yeah, I had that. But you know what? What I wrote over two years ago was still totally relevant. I made a few small tweaks (time gives great perspective), but honestly, what she published is extremely close to what I wrote back then. 1. If you sell products, check out Retail Readiness immediately. It’s so insanely helpful if you're interested in getting into wholesale work but not sure where to start (or how to continue if you've already started). I’m not an affiliate for the book, nor did Rena even ask me to write this—I just know how much information and wisdom she has, and I know how awesome the other contributors to the book are, so I’m pretty sure you don’t want to miss out. 2. Don’t be afraid of your past work. You’re smarter than you think, and if something makes you cringe a little, hey—that just means you’ve grown since then. Not a bad thing. And there’s often something to be learned from looking back on what you’ve done in the past. P.S. For a while, I wrote a column on Rena’s blog about editing your own writing that I think you might find helpful. It includes detailed tips about grammar, punctuation, and more thrilling (to me, at least) topics! You can check out all the posts about editing your own writing here.